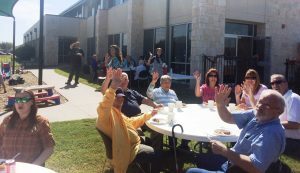 We meet every Sunday morning at 10:30 a.m. to worship together as a community in the sanctuary. Here we engage with the scripture, listen to preaching, sing together hymns both old and new, and partake in Holy Communion. [email protected] or (972) 414-6460.